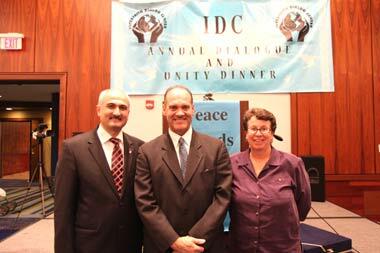 Peace Islands Institute (PII), formerly IDC, hosted its annual “Dialog and Unity Dinner” at the Hyatt Regency, in New Brunswick, November 3rd, 2011. 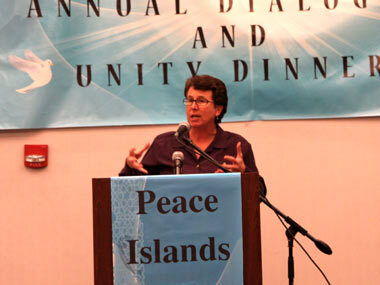 The theme of the night was “Poverty: Time to Act Together”. The program started with the reception at 5:30 p.m. Guests enjoyed the refreshments and PII Art & Essay Contest Exhibit while they had opportunity to meet and socialize with each other. 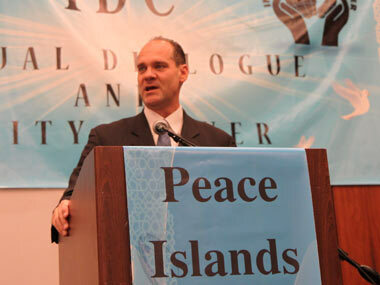 Keynote speakers were Dr. Jon Pahl from Lutheran Theological Seminary at Philadelphia and Rev. Lisanne Finston Executive Director of Elijah's Promise Soup Kitchen at New Brunswick. U.S Attorney Paul J. Fishman sent his regrets not being able to attend the program. 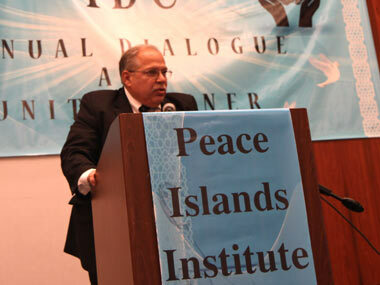 Dr. Levent Koc, Executive Director of PII NJ, presented his welcoming remarks. 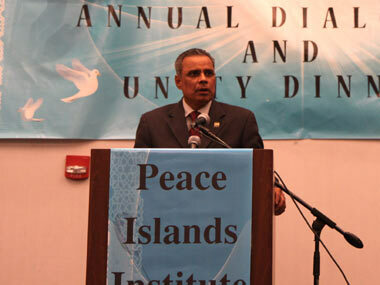 Dr. Koc emphasized on the name transition from Interfaith Dialogue Center to Peace Islands Institute. Dr. Levent Koc also touched on topic of the night, Poverty: Time to Act Together, by referring the drought in Somalia and neighboring countries. As an example to act to together to reflect our delicate feelings to such issues, Dr. Koc mentioned the Gulen Movement’s recent activity towards Somalia. Mr. Gulen conveyed his sincere feelings and concerns to his friends regarding the famine in Somalia and he suggested something has to be done for the people of Somalia. After he shared his thoughts with his friends in the month of Ramadan, his thoughts conveyed through grassroots globally and, as a result, $ 300 million dollars collected as donations in a month. "Based in New Brunswick, Elijah’s Promise’s mission is to empower lives, invite justice, and alleviate hunger, which they do in many creative, thoughtful and entrepreneurial ways: from their culinary training programto their community gardens initiative, to A better World Cafe, their “pay what you can” community kitchen in Highland Park. Elijah’s Promise is rethinking the traditional models of alleviating and ending hunger. Each year we train over 70 people in culinary arts and place them in jobs throughout central New Jersey. These graduates, all formerly unemployed, are now working, paying taxes, paying rent, buying food, clothing and other goods for themselves and their families. Instead of taking money out of the “system,” these graduates are now putting significant resources back into our community, making it far more sustainable." This cycle of social good, which harnesses the power of food to feed people and fuel a stronger, healthier, more “sustainable” community, is taking root all over the nation. It’s about ending hunger, providing access to good food, promoting health, fostering a healthier environment, strengthening our agricultural base, and making thoughtful economic development decisions." Dr. Jon Pahl took the stage and discussed and presented facts, sociology, morals, and philosophy of the “Hizmet Movement” by providing few examples. Dr. Jon Pahl is professor of History and Christianity at The Lutheran Theological Seminary in Philadelphia. He briefly explained the Hizmet Movement, or Gulen Movement, in six circles. He shared his appreciation of the activities and sound results of the movement globally. His research on the movement started with his participation in one the “Turkey Trip” programs sponsored by the organizations that are founded by Turkish businessmen, professionals, and educators who are inspired by the teachings of Fethullah Gulen. 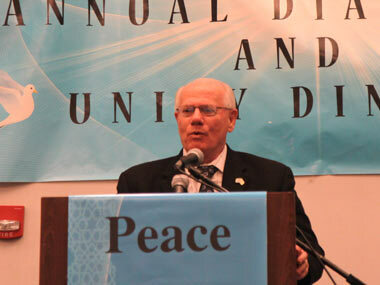 He stated that he uses one of the Mr. Gulen’s books, Love & Tolerance, to teach his students at the Seminary. At the end of the program a video of Fethullah Gulen, prepared by the EastWest Institute (EWI), was shown to the audience to provide more information about Mr. Gulen. The EastWest Institute is a prestigious think-tank organization that recognizes and presents awards to people, community, or a group that has contributed to global peace. 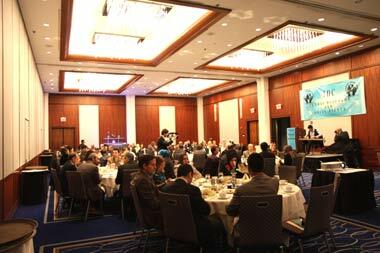 In last spring, Mr. Gulen was awarded EWI 2011 Peacebuilding Award.